Preheat oven to 350°F. Place cookies in a resealable bag and crush into medium sized crumbs. In a medium bowl, combine cookie crumbs (about 1 ¾ c) and melted butter and stir to moisten. Press mixture inside a 9-inch tart pan with a removable bottom. Refrigerate 15 minutes. Bake in center of oven until set and fragrant, about 10 minutes. Cool to room temperature on a wire rack. Lower oven temperature to 325°F. In a medium bowl, whisk together pumpkin puree, egg yolks, egg, pumpkin pie spice and salt until smooth. Set aside. Warm butter in a small saucepan over medium heat. Whisk in brown sugar and cook until sugar melts and mixture is smooth and thick, about 1 minute. Add cream, reduce heat to low and whisk until smooth. Whisk in bourbon and vanilla. Gradually add brown sugar mixture to pumpkin mixture and whisk until smooth. Pour into cooled tart shell. Bake 30 minutes, or until a toothpick comes out clean; center should jiggle slightly. Cool to room temperature on a wire rack. Refrigerate at least 2 hours. Meanwhile, make topping. In a chilled bowl, beat cream on high to soft peaks. Add mascarpone, maple syrup and vanilla, and beat to firm peaks. 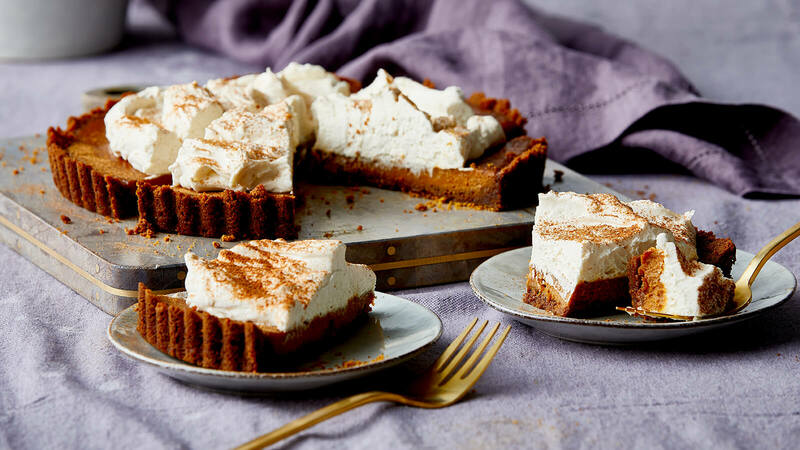 To serve, remove tart rim, generously spread cream over filling and dust lightly with pumpkin pie spice.